A bank stress test determines how well a bank might withstand an economic crisis such as the one that struck the world after the 2008 financial crisis. 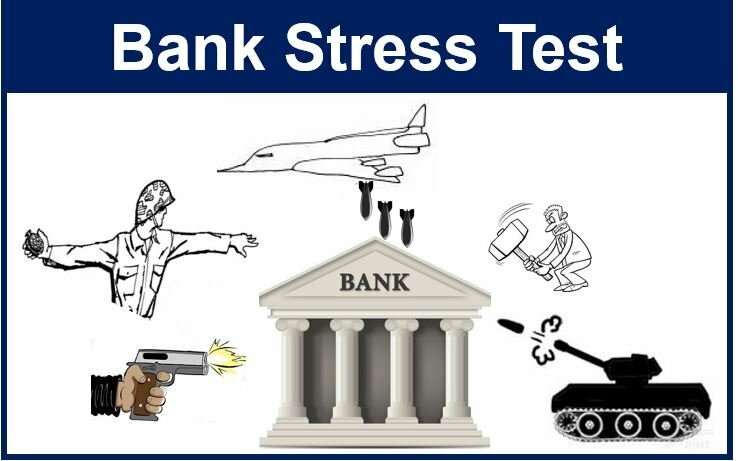 The stress test either analyzes the bank or puts it through a simulation. The simulation includes either some of the things that happen during a crisis, a catastrophic event, or both. An economic crisis usually follows a financial crisis. Unlike a financial crisis, in which just the finance and banking sectors are affect, the whole economy suffers in an economic crisis. The tests evaluate whether a bank has enough capital to withstand adverse events. It also looks at staff training. In other words, it determines whether the staff knows what to do in a crisis. Not only do the stress tests want to determine whether the banks would survive, but also whether they would continue lending. During a crisis, it is vital that households and businesses have access to loans. Banks carry out stress tests internally. Additionally, regulatory bodies also perform the tests. Examples of regulatory bodies are the UK Financial Services Authority, the European Banking Authority, and the US Federal Reserve. Additionally, the International Monetary Fund carries out a stress test. Since 2008, most countries’ authorities have been subjecting their banks to simulated financial crises. Their aim is to determine how well or badly their banks would cope. What would happen if US GDP dropped by 5 percent? Would the bank survive? Furthermore, would the bank be able to continue lending? How would the banks cope if interest rates increased by 2 percent? Would the banks be able to withstand a 50% decline in gold prices? What would happen if gas prices rose by 250%? In its 2017 bank stress test, the US Federal Reserve (Fed) said that all the thirty-four banks passed. The Fed added that the thirty-four banks would experience considerable losses in a serious crisis. However, in aggregate they could continue lending to households and businesses. Their ability to carry on operating was due to the capital build up following the last financial crisis. The Bank of England published its most recent stress test results in November 2016. Overall, the central bank said that in a severe, broad, and synchronized stress scenario, British banks passed. However, the Prudential Regulation Authorities judged that three banks needed to build further resilience. The three banks were Barclays, Standard Chartered, and the Royal Bank of Scotland. A 2014 report by PwC titled Passing the stress test, concluded that banks needed to take on more staff. Most of the banks surveyed said that more investment was necessary. In fact, only 13% of banks reported already having sufficient, suitably skilled staff to carry out regulatory stress testing. Paul Tucker, from Harvard Kennedy School of Government, talks about how bank supervision has been opaque to the public. He explains how an annual stress test’s results can transform the accountability of central banks.